What sort of damages are environmental damages? What sort of restitution is necessary to put them right? This is a foundational question for environmental theory and practice. We will argue that Talmudic thought provides a very useful set of tools and concepts for thinking about the question. The main means of compensation for environmental damage is money. Yet we instinctively feel that monetary compensation, though necessary, is not always sufficient. Chapter Eight of Tractate Bava Kamma, Ha’hovel, deals with physical damages against the person. The central dilemma in the chapter is whether restitution for physical damage to people can be adequately expressed in monetary terms. It is clear from the Mishnah that physical damage must be compensated with money. One who assaults his fellow is liable to pay five categories of compensation: physical damage, pain, medical expenses, unemployment and shame. But our chapter is also concerned to articulate the difficulties, incongruities and failures involved in paying monetary compensation for physical damage. It opens with a discussion of whether monetary damage or capital punishment is the more appropriate paradigm for considering physical damage, continues by elucidating the problems of placing a price tag on a human limb, or on such irreducibly subjective experiences as pain and humiliation. The chapter concludes by specifying what an assailant must do to make restitution for his damage, even after he has made all of the requisite monetary payments. The Talmud apparently wishes to impress upon us that although financial compensation is a necessary act of reparation for a physical attack, it is in no way sufficient. There are social, psychological and spiritual consequences of the assault that money cannot make good. The German word for reparations, wiedergutmachen is, to the gemara, a misnomer. Monetary payment must be made, but it does not “make good again.”9 Full reparation must also take place at a very different level. This chapter should be of particular interest to anyone interested in Jewish environmental ethics, because it contains the longest Talmud discussion of Ba’al Taschit. Many writers on the subject have identified Ba’al Taschit,the prohibition on wanton destruction of property or natural resources, as a particularly promising source of Jewish environmental wisdom. Others have expressed a certain disappointment with ba’al taschit as a source of usable environmental teaching, arguing that it is too human-centered a criterion. We consider the discussion of ba’al taschit in its context of Perek Ha’hovel. Examining why ba’al tashchit is placed in this chapter of Bava Kamma, and how it partakes in the chapter’s central problematic will give us a renewed understanding of the usefulness and potential relevance of the concept for environmentalists. On my recent trip to the US I encountered a lot of inspiring people, Christians, Jews, Buddhists and Muslims working at the frontier of religion and climate change. They are creating new ecological vision rooted in ancient traditions, and mobilizing their communities as forces for change. Two of the most impressive Jewish activist leaders whom I met were Rabbi Arthur Waskow and Rabbi Avi Weiss. They have been engaged with ecological issues for sixty years and for a few months respectively. In different ways, the very length and briefness of their involvement is inspiring. His involvement with the issue goes back four decades earlier. “My Bar Mitzva fell almost a year to the day after the first bomb was dropped at Hiroshima. Even then I knew it changed everything. 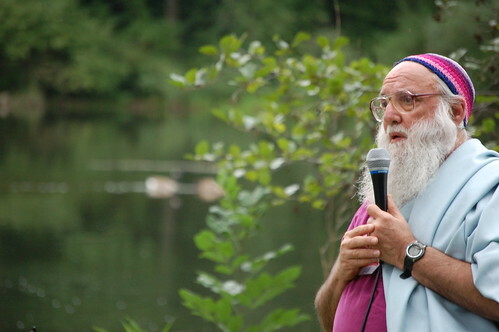 I gave a speech about how this awesome human power to destroy needed to be a new reverence for the world and for all its people, if we were not to end up annihilating ourselves.” In different ways, Rabbi Waskow has been teaching the same message ever since. Over recent years, climate change has become the focus of that warning. 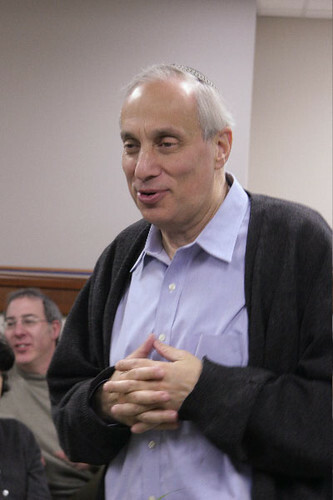 Rabbi Avi Weiss, an Open Orthodox Rabbi from the Hebrew Institute of Riverdale in New York, is one of the Jewish world’s most courageous and indefatigable Jewish activist leaders. Over the past forty years he has stood at the forefront of countless campaigns: for Soviet Jewry, against the siting of a convent at Auschwitz, against Former Mayor of New York David Dinkins for his indifference to the murder of a Chabad student and many more. In 2002 he was instrumental in putting together a mass rally for Israeli victims of Terror when the organized American Jewish community was largely silent on the issue. He has incurred plenty of establishment anger over his career, but Rabbi Weiss’s principle is to speak out when it is right to do so, not when it’s popular. I asked Rabbi Weiss whether global climate change was an issue for Jewish concern and activism. Rabbi Weiss demonstrated this commitment by agreeing to serve on the advisory Board of Jewish Climate Initiative! Two powerful, but very different moral voices in the Jewish world: One shows the importance of ecological issues by his commitment to them over decades; the other by arriving at a conviction about their vital significance after a long journey.